Easier than pie! This free form fruit tart is terrific with vanilla ice cream or a dollop of crème fraiche. Bring pie crust to room temperature as directed on package. Unroll the pie crust on a non-stick or parchment paper-lined baking sheet. 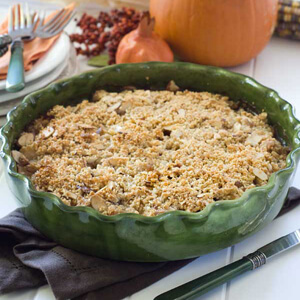 Spread one tablespoon of caramel topping on the crust, leaving a 1 ½-inch border. Peel, quarter and core the pears. Slice each quarter lengthwise into 4 even slices. 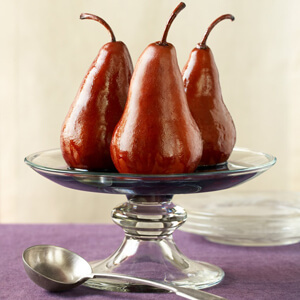 Place pear slices in a bowl and toss with cinnamon and flour. Starting in the center, arrange the slices on the dough in a spoke pattern, in overlapping layers as necessary to fit and leaving a 1 ½-inch border. Drizzle the pear slices with 1 tablespoon of caramel topping. Fold the edge of the crust over the tart. Brush the top of the crust with milk and sprinkle with sugar. Bake 30 minutes or until crust is lightly brown. Let galette cool 10 minutes. Drizzle top of the fruit with the remaining tablespoon of caramel topping before serving. Winner! Winner! Tonight’s dinner!! This is going to happen today!! Thanks! !